Touching up a wall or door after you’ve painted it is a lot like touching up the finish on your car. The touch-up paint you find in the glove box may be an exact color match to the color of your car, but if you use it on a scratch, it’s not always going to blend in. 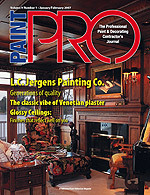 by Ron Franklin, Ron Franklin Painting & Decorating, Sacramento, Calif. The same sometimes goes for paint. If you spray a door, the finish will be smooth. If the finish gets dinged, you are most likely going to do your touch-up with a brush, and it may stand out. What’s more, time and weather have aged that paint, even if the coat is only a couple of weeks old. New touch-up paint can make a wall look blotchy, like it has German measles. But all is not lost. Here are some tips to consider that will make touch-ups as painless as possible. The key is to never get to a point where you have to touch up. Try to prevent doors from getting dinged on the job. I store them in a part of the work area where they will be protected until they can be installed. If there is a mark on a door or wall, consider cleaning it off first. Use a cleanser such as Soft Scrub on enamel. A fine duster or a damp cloth will clean the dust off the area surrounding a mark. A spot where a bit of dust or grime has been rubbed off will be less visible than a new dab of paint. While doing the job, hit a small spot on a painted wall with a brush to see how the spot dries. That will give you some idea of how to treat touch-ups later. Sometimes it’s helpful to apply touch-up paint the same way it was put on the first time. If you use a brush at the beginning, you will not have as many problems getting a touch-up with a brush to blend in. If you used a roller, you might consider using a miniroller to touch up your marks so the stipple can look similar. Certain colors and sheens are worse than others when it comes to blending in touch-ups. Black and other darker colors tend to make touching up more difficult. Paint that doesn’t have a lot of shine to it, like a flat or eggshell, is a lot easier to touch up. Always try to touch up jobs when the owner or customer is not around. If they see you touching up spots, they’re going to focus on those spots, trying to see problems. Educate your customer. On one recent job there was a three-week layoff between painting the doors and coming back to touch them up, because the homeowner wanted to install gutters and fixtures. So I warned the homeowner: Touch-up paint applied at that point might show. You can sometimes anticipate that a job will require touch-up, so you can school the customer before you even start. Another thing you might tell a customer is to give the touch-up a few weeks. Sometimes it will fade and blend in better after it’s been exposed to the same dirt and UV rays as the paint around it. On one recent job, I needed to touch up two doors I had sprayed black semigloss. Before I painted them, the customer said she wanted to keep the old knobs and other “hardware.” After I painted them, she changed her mind and said she wanted to put on new hardware. This was tough. Hardware makes impressions in the wood, so when it is removed, you need to put in filler. And the new hardware didn’t cover all the areas the old hardware covered. There was also a lot of dust on the doors at that point, and with black you can see the dust. Raised panels on the doors also complicated things. Five or eight years ago, I might have sprayed the whole door again. But you just can’t stay in business that way. I had tried to prevent this from happening at the very beginning of the job. I used a compressor and fine duster to blow and dust off the doors and followed with a damp cloth to wipe them down. The bare spots on the door had not even been primed. So I applied some leftover primer to the spots and used a heat gun to dry them. I knew brushed spots would show on the sprayed door. So I thinned the paint down so it would flow well, then brushed down the entire panel that contained the lock and the knob. The paint was a water-borne product from Kelly-Moore. Once applied, the brush lines on the diluted paint flowed together. The panel I brushed was the length of the door and 5 inches wide, so I used a 3-inch square-cut brush. The faster I could get paint on there, the better. Waterborne paint sets up faster on a warm surface, and each time I had to go back into the paint, the paint on the door was drying. The key is: You get it where it belongs, fast. I swung the doors into the house to keep them out of direct sunlight. Another technique to keep a door cool is wiping the door down with a cool damp cloth, then drying it afterward immediately. This will lower the temperature of the door by a few degrees. Doors get warm, and when you put your hand on a door you can tell. After the paint is applied, don’t brush it again. Sometimes people rebrush an area trying to make it look smoother, but that doesn’t work, because the paint has become stickier. I also sent the client away so she couldn’t watch. You could see a difference in that one board. It looked a little bit different. There was a color difference, ever so slight, possibly because of the difference between it being brushed on and sprayed on. But I let it go. I had established myself as an approachable person. I know if the customer had any problems with the job she wouldn’t hesitate to call me — I don’t want bad word of mouth. If she didn’t like it, I would have redone the whole door. Keep in mind that as a person with a trained eye, it looks slightly different to me. I have a critical eye and I do this all the time. But another person might not even notice. Sometimes you have to realize that if you lean to being a perfectionist you become your own worst enemy. The customer loves the doors. Maybe if I looked at them like she does, I could see that. They are not perfect, but they are still really good.